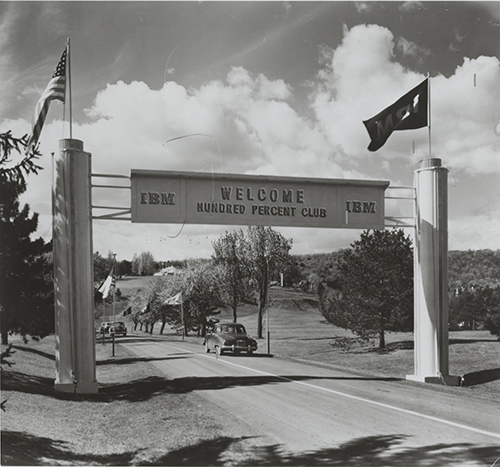 This is a black and white image of a gate entrance to IBM's hundred percent club. It is an outdoor image shot during daylight. There are three cars on a road with trees and grass in the foreground and background. The gate sign in the image says "IBM WELCOME HUNDRED PERCENT CLUB IBM". The light is coming from the left side of the image. The image itself still looks crisp with slight blurrying around the edges. Written in black ink on verso top left side corner is "#58 100% Club Endicott-1947". Stamped in black ink on verso side near center and top right corner is "167" and "58".